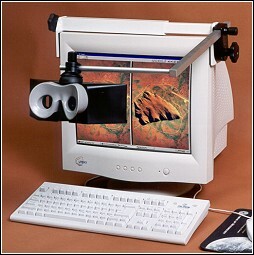 Now in ever increasing demand, the ScreenScope brings true 3D viewing to your computer screen. Easily transported and erected, ScreenScope fits a variety of computer screens and avoids the need for expensive hardware upgrades. It is simple as "Clamp and Play" ScreenScope also offers improved user comfort and is completely free from screen flicker. Not only is the arm that moves the viewer adjustable All these also have adjustable mirrors which allow for easy viewing of many sizes of images. Direct clamp to your monitor from 14" to 21"
Adjustable mirrors allow for easy viewing of many sizes of images. Provision for personalized viewing lenses. No screen flicker: Greater user comfort. No expensive hardware upgrades are required. Minimal setup time. As easy as "Clamp and Play"
Also included are the Supplementary Lens for ScreenScope which will slightly magnify the image. This version has a base which allows the ScreenScope to get further away form your monitor and is made for larger LCD screens (up to 22 inches). It also doubles to offer a way to view large printed material in parallel format. Now in stock! New ScreenScope Handheld now with adjusting mirrors! We now offer the ScreenScope Handheld. This is the same optically as the two viewers mentioned above but includes a handle and does not clamp directly to the monitor. This new adjustable version can view almost any size pairs. It can view side-by-side images on the computer as well as large side by side stereo photos printed photographically or on the computer. It now comes with Supplementary Lens for ScreenScope which will slightly magnify the image. The lenses are removable.